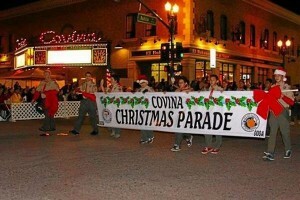 Tonight is the 64th Covina Christmas Parade,. A big event for my little town. Saturday mornings the town is a buzz with folks putting up their lights and setting up their lawn chairs along the parade route. At 6:30pm, the parade kicks off. There are numerous high school bands, city dignitaries, a grand marshal, and various floats from the local religious and n0n-profit organizations in town. The parade is capped off with Santa Claus and a cadre of city street sweepers Awards are given to the best bands, floats, and other entries. Roughly 25,000 people will invade the streets of my little town. 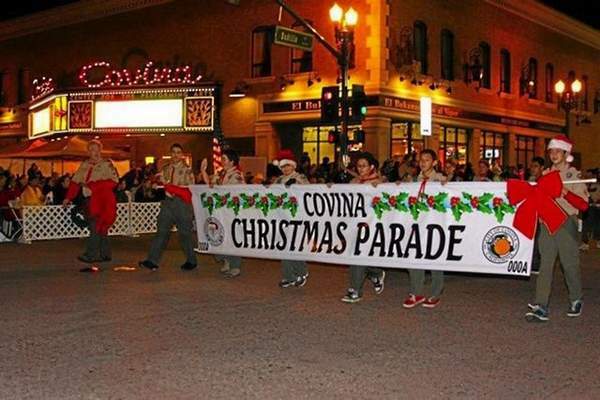 Originally, the parade route went down Citrus, past the numerous stores in downtown Covina. It was a kick off of the Christmas shopping season, a 1950’s version of today’s Black Friday. The route was changed to Badillo in the 70’s to accommodate the growing crowds. People come from all around and it has been said that it is one of largest nighttime Christmas parade in Southern California. The evening is a big deal for many people. As a kid, I marched in several parades playing my clarinet. My wife and sister carried the two E’s of the “Traweek” banner pieces, announcing the coming of our Jr. High School. In my later years, I rode atop a float as the Grand Knight of the Fr. Maguire Council. This float took the top award for a religious float in 2003. But, I am not a parade person – never have been never will be. So my parade evenings are spent on the porch, which is located one block off the parade route. My evening is spent with non-parade goers, smoking cigars, drinking martinis, playing Christmas music, wishing parade watchers a Merry Christmas, and opening the house to cold revelers with weak bladders. Cars carrying the City Councilmen and other dignitaries will usually speed down our street on their return, I play the grumpy old guy in yelling at these folks to slow down. The lights are up and the house is decorated, thanks to an energetic son and grandson, so if you are looking to smoke a cigar, have a drink, have a weak bladder, or want to kick off the Christmas season in a Concialdi way, stop on by–the porch is open.